Shop Favorite! Crystal Clear Pickups 1959 Stratocaster set. 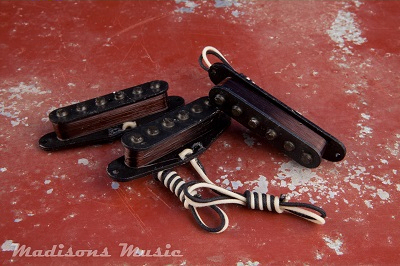 Our '59 set is a reproduction of the late 50's early 60's black bobbin pickups. Hand wound with a 42 vintage plain enamel wire. Our '59 set is crisp, natural, and bubbly. Incredibly pure and raw tone you would expect from a late 50's strat pickup. Alnico 2 staggered pole magnets. Our aged pickup can be aged to any level of distress. Our hands on experience with vintage instruments gives us the upper hand to reproduce authentic vintage tone.